Durable, easy to clean, and scratch resistant are three important things that come to mind when the words laminate flooring are thrown around. This type of flooring was invented by a Swedish company called Perstorp in the 1970s, which is why when you think of laminate flooring, you probably think of your house growing up. The company, Perstorp, has been making this type of flooring since 1923, but it wasn’t marketed until the 1980s in Europe and then 1994 in the United States. Perstorp is still around, but under a different name and continues to create laminate flooring that has revolutionized the flooring world. From glueless to alternative methods for holding the flooring panels together, laminate flooring comes in many different forms. 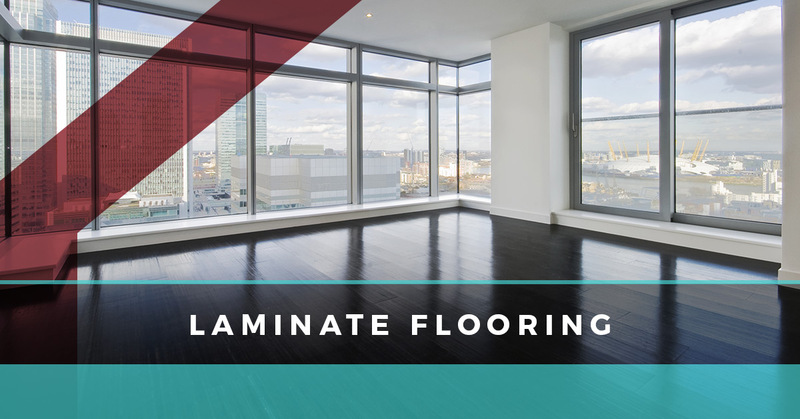 Laminate flooring is one of the many installation services that we offer at Zoltan European Floors, Inc. Additionally, we offer tile, carpet, hardwood, linoleum, and many other flooring services. Laminate flooring is a relatively new type of flooring. It’s only been around for 40 years or so and only available in the United States for a little over 20 years. However, that doesn’t change how beneficial this type of flooring is for your house. Laminate flooring is a great option for homes that want the look of hardwood without having to worry about all of the maintenance for it. You can also get a laminate flooring that simulates stone flooring to give your residence a more natural vibe. Laminate flooring is a multi-layer flooring product that’s synthetic and fused together with lamination. Laminate means that the floor is protected by a clear protective layer, which is why you don’t have to worry about damage. This layer is made of melamine resin and fiber board materials. Laminate flooring is growing more and more popular because it’s easy to maintain and it’s durable for families who have a home filled with kids and furry friends. There are several benefits of laminate flooring, which is why it’s become so popular in homes all around the world, not just in America. The first benefit of the laminate option for floors is that it’s affordable. It’s easy to install and costs less than more traditional options for flooring that you might find on the market. If you absolutely love hardwood flooring and you want to install it in your home, but it’s not within your budget, then laminate flooring is a great alternative. 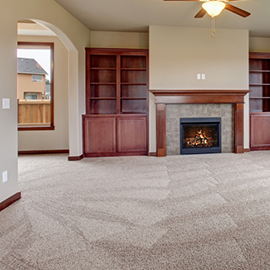 Flooring can be expensive, especially if you have a lot of rooms you’d like to cover. Laminate flooring offers you a way to get what you want without having to pay the full price for flooring that’s more pricey. As a cost-effective option, it’s no wonder so many people choose laminate flooring. The second reason that this option is preferred by many is that it is hygienic. A clean home is a healthy home, after all. In a home that has children running around in it and animals making their way through the house, having a floor that has antimicrobial resin is essential to keep the household healthy. 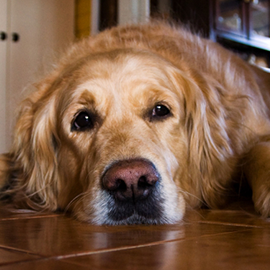 As a parent of pets, kids, or both, you know how hard it can be to keep a house clean, which is why having flooring that has antimicrobial resin in it can be a major advantage. It can be difficult to maintain a healthy atmosphere in the home if you have small children or pets that want to leave you gifts that are less than ideal. For this reason, laminate flooring could be essential to your home to ensure that it’s healthy. Building off that benefit, laminate flooring is also very easy to clean, which we’ll move further into below when we cover the maintenance of laminate flooring. You don’t have to worry about water making its way in between the cracks to warp your flooring. You don’t have to maintain your flooring in a particular manner to ensure it’s immaculate and in perfect condition. Essentially, laminate flooring is easy to tidy up no matter the brand you decide on, unlike other types of flooring on the market. The third benefit of laminate flooring is that it’s durable. It’s scratch resistant, so you don’t have to worry about your animals, kids, or even yourself accidentally leaving a mark on the surface. Lastly, this option is perfect for those who like the traditional look of hardwood floors, but don’t want to maintain it. You can have the best of both worlds with this flooring alternative. Laminate flooring is made out of particles of aggregated wood that are created from high pressure to form the sheets. The sheets of these wood particles are made from photorealistic images of stone or wood. The wood or the stone imaging will be put on the top and then covered with the wear layer. The wear layer is what makes it durable and scratch-resistant. Without this efficient wear layer, the flooring would be susceptible to moisture, scratching, and UV rays. Additionally, the wear layer creates a linchpin between the lower layers and the exterior elements. This clear sheet of plastic is thin and prepared to protect your flooring. To break it down further, we supplied more information about each layer. The wear layer is the surface of the laminate flooring. These two thin sheets of paper have melamine in them and are used as the top surface layer. There’s a hard transparent plastic sheet that’s impenetrable by animals, spills, high heels, and other items that would scratch this layer. The next layer in laminate flooring is the image layer. The image layer is what makes the flooring look like wood or stone. When you look very closely at this layer, you’ll find that it looks realistic with the photogenic image of real wood under the wear layer. Now the last layer is the core one and is under the image layer. The base layer is about a half of an inch of wood-chip composite. This layer is susceptible to water damage and is considered to be stable, but not by much. While it can withstand some water, it’ll only remain unaffected if the water is removed from the boards as quickly as possible. Essentially, this layer is the core of the floorboard and needs its counterparts to be protected from damage. So which rooms look great with laminate flooring? A lot of them! 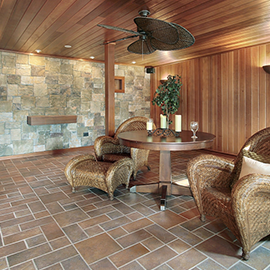 What’s great about this flooring is that it can go in high-traffic areas such as the foyer or entryway or the mudroom. Due to the resistance, this flooring option will be protected from grime and other dirt that may be tracked in by your kids. In addition, because it’s durable, it’ll hold up against the constant maneuvering in the area. You can install laminate flooring in the kitchen, dining room, even the living room. While we encourage you to choose wisely where you want to put it, since you don’t want to overwhelm people with the amount of laminate flooring in your house, this type of flooring is perfect for a majority of houses. When it comes to maintenance for laminate flooring, you’ll be very impressed with how easy it is. What’s great about this flooring option is how simple it is to take care of. There’s no wonder that so many people who have kids, pets, or just plain hate cleaning decide on this flooring option. The care that goes into laminate flooring consists of minimal activity since the wear layer of the floorboards protect it from dust, dirt, and scratches. While you’ll want to keep laminate flooring relatively dry because sitting in water can cause the floorboards to be damaged, the wear layer is water-resistant and if wiped up quickly, won’t be a major problem. As a flooring option that’s perfect for high traffic areas, it’s hard to truly damage the laminate, but it’s not impossible. When you purchase laminate flooring at Zoltan European Floors, Inc. services, you will have everything covered. As a flooring company, we pride ourselves on going above and beyond for our customers to make sure that your home looks fantastic. We know the importance of your residence looking good, which is why we do everything we can to help you be proud of the place you call home. 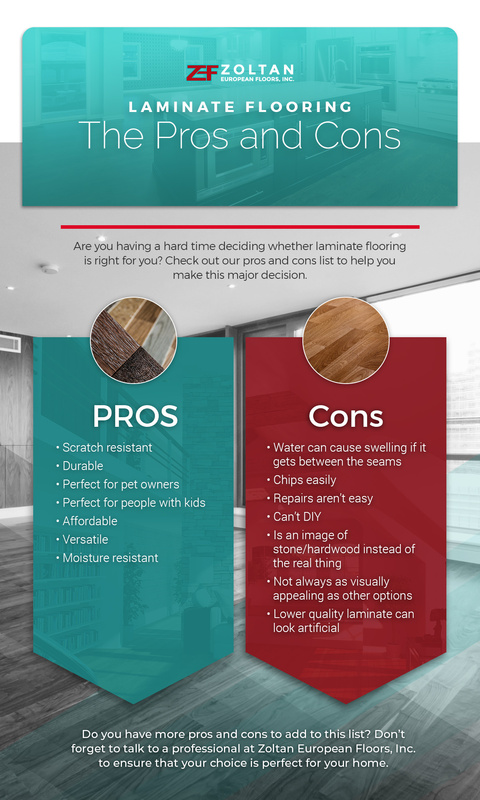 Our team of flooring experts will lend a hand in making the final decision for you if that’s what you choose or if you need another opinion on what would be best for your home. Additionally, the installation process won’t take days on end because we know your time is precious. From small flooring fixes to installations, we’ve managed to handle it all. For further information about our company, contact us today to schedule a consultation.